Personalised Prosecco in a Gift Box is rated 4.5 out of 5 by 11. Any name and date can be added to the bespoke black label on this quality Prosecco. 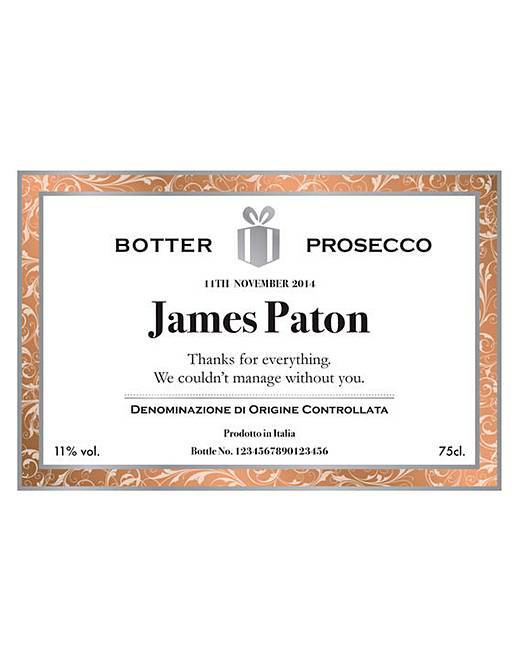 You choose the occasion by adding your own personal message to the recipient within the label's unique design. Each personalised bottle contains premium Prosecco imported from Italy. With a crisp taste and delicate bouquet, the bubbles release hints of peach and apple followed by notes of acacia and wisteria, creating a fresh and light feel on the palate. 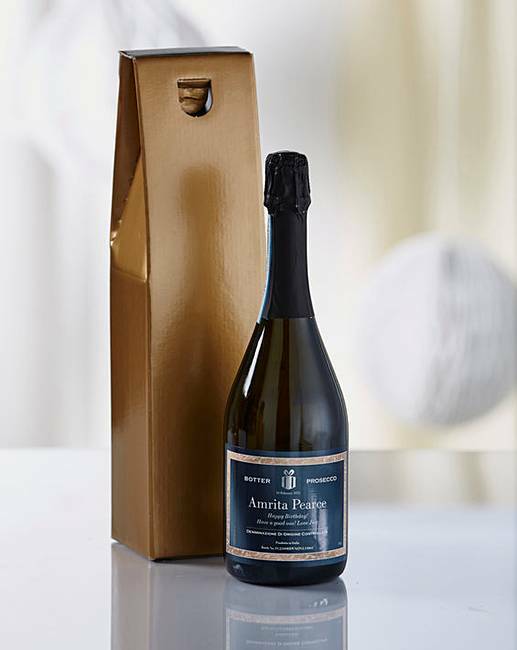 This fine sparkling wine is perfect for toasting the occasion and is as unique and individual as the recipient. 75cl bottle presented in a gold gift box. Personalise with name up to 25 characters and message up to 35 characters (including spaces). You must 18 or over to purchase this product. Please note we are able to deliver this item to GB Mainland only. Rated 5 out of 5 by Mavaughan from Personalised gift Bought this for a 40th wedding anniversary gift for friends of ours. Arrived quickly well packaged and a really nice personalised label. They were very happy with it. Rated 2 out of 5 by Grace57 from Mistakes Got this for our anniversary when it came the personalisation was all wrong and words were missing. Wasn't impressed. could have brought an ordinary one from the shop if I had known!! Rated 5 out of 5 by Jensen5 from Nice! Brought for my nephew for Xmas as he loves this. To have it personalised is a fantastic gift idea. I'm sure he'll love it.